I’m almost certainly a social media addict. Don’t get me wrong… I’m not one of those people constantly attached to their phone and I am, quite frankly, horrified that people can go to Twitter jail*, but… I do tend to rely on social media on a daily basis. When I lived in this State’s capital, Brisbane, I depended on a few different twitter accounts (SEQ Incidents and Qld Rail for example) for advice on traffic conditions and public transport hiccups. And when I moved back to the Fraser Coast I searched out all possible local Facebook and Twitter accounts to follow. Which is why last Thursday I put out a Facebook question about breakfast dining options in Maryborough. 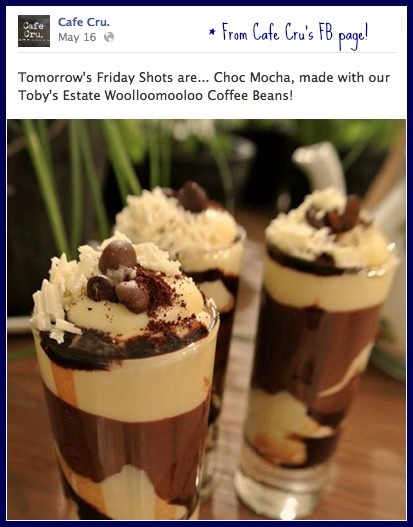 Sadly suggestions were minimal but… during my day’s online trawling I came across reference to a Maryborough cafe which: 1. Opened early; and 2. Showed some social media savvy. 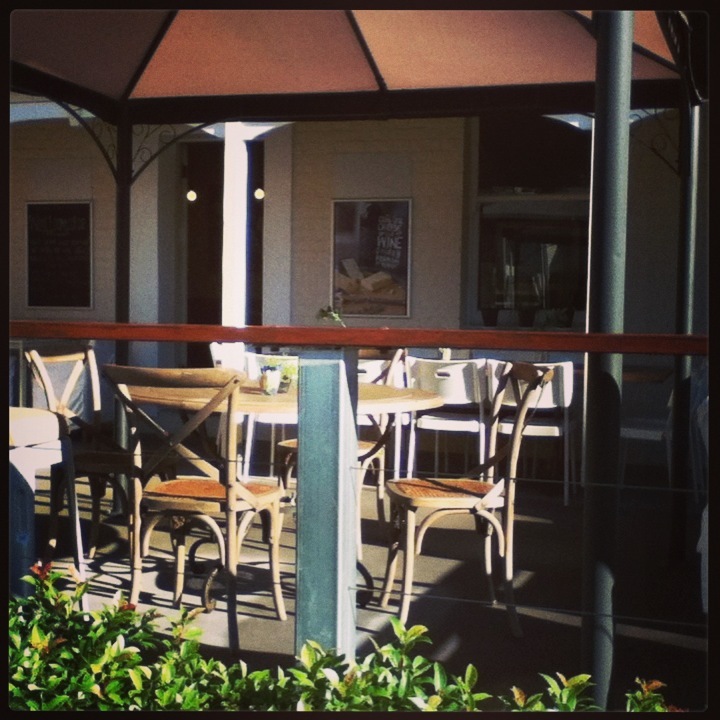 Cafe Cru is obviously a bit of a hidden gem as my mother (a long-term Maryborough resident) and a couple of other people I spoke to had no idea the place existed or where it could be found (near the Mary Poppins statue, incidentally!). But, after a call to check that gluten-free options were available it was the planned venue for Friday’s breakfast. However… although the ambience is great (I loved the look and feel of the place including the eclectic furniture), the menu was more limited than I expected. If you’re extremely a tad fussy like me you may struggle. Although GF bread was available none of the three or four bruschetta breakfast options tempted me. Mum was happy to have a ham and cheese croissant but, rather than ‘make do’, we decided (albeit reluctantly) to go elsewhere. Instead we ventured into Allikats on Kent. On arriving I confirmed GF options were available and was happy that they were easily able to run through my choices. 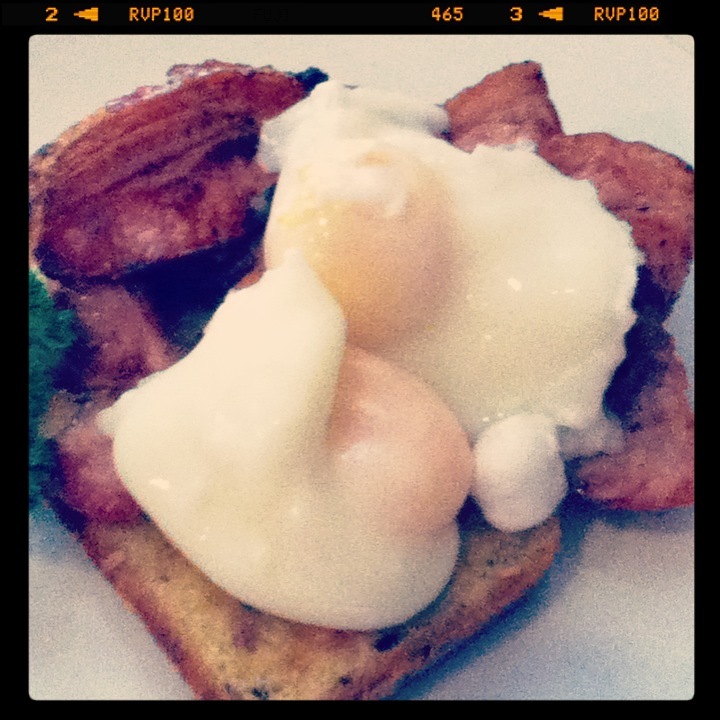 Both mum and I settled on bacon and poached eggs on toast and enjoyed our respective breakfasts. I noticed that Allikats also had gluten-free cupcakes and cake in their window – had I been there for a snack rather than brekkie. I have to say I was surprised what a struggle it was to find something open (before 9am) in Maryborough for breakfast. My mother dines out fairly regularly (mostly lunches and morning/afternoon teas) and always asks after gluten-free options on my behalf. She knows I’ll groan if the only choice is the seemingly popular orange and poppy-seed cake which graces many-a-cafe-shelf. I’m happy to receive suggestions in the interim! * Sad, but true. You can only send a limited number of tweets a day. Apparently.